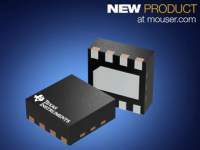 Mouser Electronics, Inc. has signed a global distribution agreement with Pyreos, a U.K.-based passive infrared sensor developer and manufacturer. Through the agreement, Mouser is now stocking a variety of Pyreos' mid-infrared detectors for applications in air quality, breath measurement for medical applications, gas and flame detection, motion, and gesture. 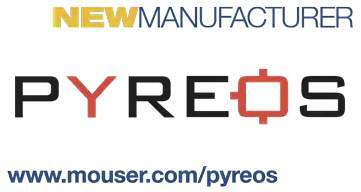 The Pyreos product line available from Mouser Electronics includes ezPyro™ digital SMD pyroelectric infrared (IR) sensors, the world's first surface mount pyroelectric sensors for gas and flame detection and food analysis. Comprised of gas detection sensors, flame sensors, and broadband sensors, the ezPyro SMD sensors offer high sensitivity, fast response, low power consumption, high levels of configurability, and easy integration. Industry-standard I²C communication and supporting software library enables plug-and-play connectivity to microcontrollers and allows easy tuning and calibration. Mouser Electronics is also stocking Pyreos linear arrays and evaluation kit as well as a variety of single, dual and quad TO-39 sensors. The Pyreos thin film pyroelectric flame sensors offer exceptionally high responsivity and a wide field of view of typically up to 120 degrees. These current mode sensors have excellent signal-to-noise ratio (SNR) at the 3 - 30 Hz frequency range. In the case of a flame they can provide accurate discrimination of flame sources in triple IR flame detection systems. All Pyreos sensors have class-leading rapid recovery of less than one second from thermal and mechanical shocks. To learn more, visit www.mouser.com/pyreos. 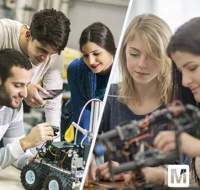 Mouser Electronics, Inc., the New Product Introduction (NPI) leader empowering innovation, announces a global distribution agreement with Pimoroni, designers and manufacturers of tech treasures for makers, educators, and creatives. Through the agreement, Mouser now stocks Pimoroni's accessories for Raspberry Pi, Arduino, and micro:bit boards.